In our Society’s newsletter, available to members, there is a section entitled TEN QUESTIONS/TEN ANSWERS with a member answering questions concerning one’s involvement with local history and recollections of past events. This issue features dedicated volunteer Dot Loy. Since it was my idea, it only seemed appropriate to go first as a “guinea pig.” One question involves early participation in a local historical event. In my answer I recalled the dedication of the Schuylkill Haven Library when I met Governor William Scranton. But now, giving more thought….and in the Christmas spirit….I recall an earlier historical event, during the middle of the Eisenhower years. It was the day that I, a first grader at St. George’s Elementary, saw a TV celebrity perform in Shenandoah. One must understand that in the 1950s parents did not hover over their children as they do today. Basically, kids were put outside and told to come home for dinner or, at least, by bedtime. So, I was part of the crowd wandering around the melting pot of Shenandoah, which I thought to be the center of the universe. And in any event my ten year old sister would keep an eye on me in that universe. It was on a cold “Black Friday” afternoon, November 23, 1956 when the parade kicked off at Girard Park. Under the direction of Edward McDermott, the J.W. Cooper High School Band led the way (McDermott would be band director for 37 years, starting in 1937). Sitting on top of the Polish-American fire truck was Santa Claus. The guest of honor rode in an open 1957 convertible sponsored by Klitzer’s Ford Motors which was located on Gold Star Highway. Lastly, the rest of the local dignitaries and performers all stood on the flatbed truck, courtesy of Herbert Ratzburg’s lumber yard. The parade seemed to zig zag around the town before reaching its destination at the corner of Main and Centre Streets. There, a large decorated platform was erected on which Shenandoah’s Chief Burgess Adam Balkiewicz would officially open the show. The huge crowd of cold, but warm-hearted, children surrounded the platform erected outside the Miners National Bank. Balkiewicz, who passed away in 2005, was a true civic leader in Shenandoah and wore many hats- WW II vet, welder, fire fighter, police chief, and now chief burgess. He dedicated decades attempting to make Shenandoah a better place. This entire event was sponsored by the Shenandoah Merchants to kick off its official Christmas shopping season as Shenandoah had a vibrant downtown. 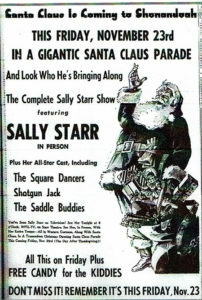 To young children, Sally Starr was famous. Why she was more popular than Chief Halftown or Capt. Kangaroo. 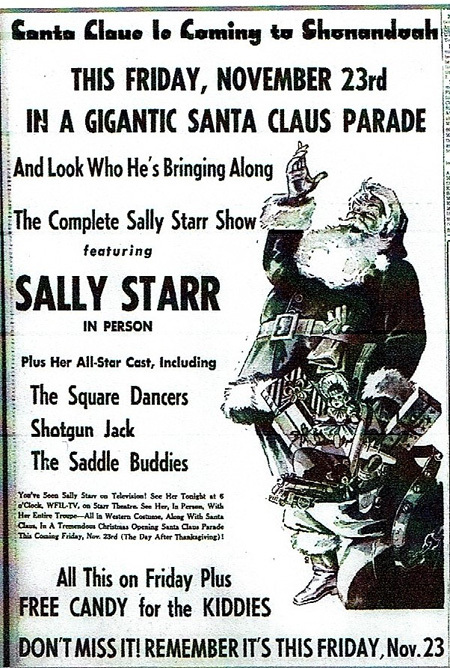 It was Sally Starr who introduced baby-boomers to Gene Autry, the Cisco Kid, the Three Stooges, Popeye, and Clutch Cargo. I watched her show on our black and white Philco television. She was a gun-toting cowgirl who rode a palomino horse named “Pal” and she was here in the anthracite region. To entertain us! What more could one want – except a pair of gloves, perhaps – as it was a nippy 31 degrees. The parade was to start at 12:30 but Sally was delayed in the heavy “Black Friday” traffic so the wait lasted an additional 90 minutes. It was at 2 pm when the show got started. The wait was worth it. Pottsville’s WPPA radio personality Walter Jones gave the welcoming remarks and then introduced Stanley Mika the grand marshal of the parade. Chief Burgess Balkiewicz officially welcomed both Santa and “Our Gal Sal” to Shenandoah to a tumultuous roar from the crowd as he presented her with an oversized key to Shenandoah. There she was, Sally Starr, in person! No longer a grainy black and white image on the Philco TV. The crowd roared once again when Sally, wearing her white hat sitting atop her long platinum blonde hair, her fringed jacket and white boots, accepted the key from his honor, Burgess Balkiewicz. 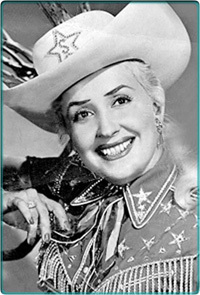 In her “western drawl” she thanked all the boys, girls and parents of Shenandoah for making her one happy cowgirl. When Starr took her white hat off and waved to the crowd, everyone clapped and cheered. The roar of the crowd became louder when she promised to hand out her photo and boxes of “Good and Plenty” and “Sky Bars” to everyone. She then broke into an upbeat rendition of Hank Williams’ “Hey Good Lookin,” followed by another tune while square dancers performed in front of Fetter’s Dairy Store. Her side-kick Shotgun Jack sang a western version of “Hound Dog,” which was popular that year. Shotgun Jack was no Elvis, but he got the crowd moving about. With the show ending Sally instructed all the children to head over to the Rescue Hook and Ladder Company Building for her free photo and candy give-away. Sally and her troupe finished up by waving good-bye, wishing everyone a Merry Christmas and promising to return to Shenandoah. A promise I believe that remained unfulfilled. Sally Starr died in 2015 at the age of 90. Everyone in the crowd waved and yelled good-bye as her bright yellow bus departed back to Philadelphia. It was a quick trip as she went on the air at 6 PM that evening! The whole event was a Christmas memory in the making. As I headed home, now eating my Sky Bar and holding her photo, a light snow began to fall. I would stop at Abrachinsky’s Store on West Coal Street to look at the Lionel “Anthracite Express” train set now on display…as well as a vast array of toys and games. Christmas was approaching in the age of innocence and confidences. Please support the Schuylkill County Historical Society’s Annual Appeal. You can donate on line. Also, don’t forget to visit our gift shop in person or on-line for local gift items.